When self-driving cars become commonplace this topic will be moot. The cars will all be programmed to drive at the posted speed limit while keeping a safe distance from other vehicles. It will be ideal. They will all be rolling along at the same speed with no need for passing. The highways will take on the appearance of assembly lines. They will go the "speed limit", but I suspect the "limit" will be much higher. As long as no one's crashing into each other, and all the cars and trucks are going the same speed, traffic could easily maintain 90-100 mph. Really, the theoretical maximum limit is the limit of the efficiency of our vehicles. Maintaining too-high of a speed for too long is terrible for fuel efficiency, gas or electric. There is maximum speed while turning (depending on coefficient of friction, and slope in the case of entrance/exit ramps), and there is a maximum acceleration that's safe for humans. I think this would limit it to some value below 90-100 mph in areas with frequent exits (and much lower on surface roads, where left turns are allowed). 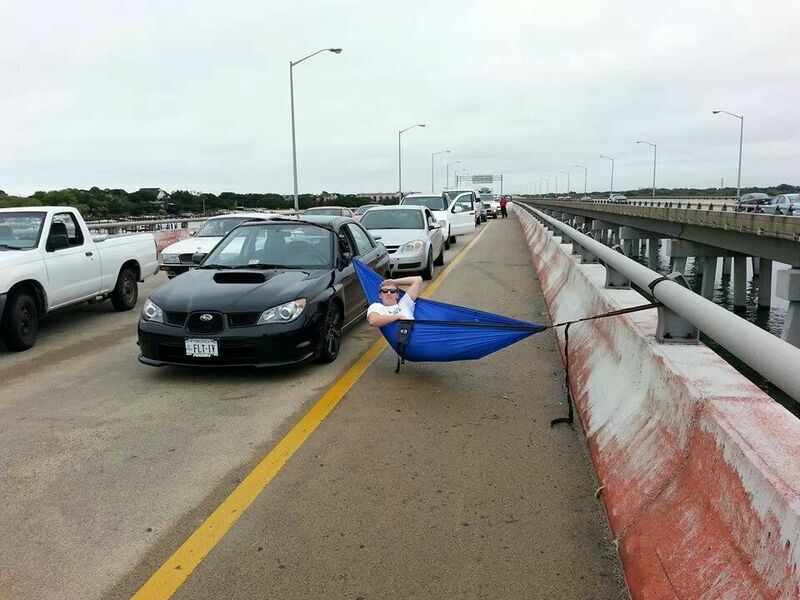 There's no tent, and he's technically in the shoulder, but does this count as "left lane camping"? It will be awful as people think that they can get there faster if they were driving. All it will take is one malfunction that causes deaths to make people rethink this. At least when accidents happen now, some driver is to blame. When self-driving accidents happen, some opaque system will be. It is the first step towards the Apocalypse. Yes, true. But as cars advance, the amount of force they can handle will inevitably go up. There used to be a point where all SUVs had tip-over warnings on the visor. While some still have the warning, most don't because manufacturers have found many, many clever ways of preventing a car from tipping over on a sharp corner (ESC, lower center of gravity, amongst other things). This is just in about twenty years. By the time self-driving cars are mainstream, I can't even imagine how much safer they'll be. There's still a physical limit, I won't deny that. But we'll quickly approach that limit. My feeling is that cars will go as fast as they can on the straights, and intelligently slow down in advance of the 'hard stuff' (chiefly, bends). Surface streets are another story entirely. I have not the slightest idea how they'll work. They still have a very long ways to go. The car can't tell the difference between a semi trailer and a BGS? The car can't tell the difference between a semi trailer and a BGS? We just talked about this in another thread, didn't we? Maybe it was some other board. The accident occurred on a divided highway in central Florida when a tractor trailer drove across the highway perpendicular to the Model S. Neither the driver — who Tesla notes is ultimately responsible for the vehicle’s actions, even with Autopilot on — nor the car noticed the big rig or the trailer "against a brightly lit sky" and brakes were not applied. In a tweet, Tesla CEO Elon Musk said that the vehicle's radar didn't help in this case because it "tunes out what looks like an overhead road sign to avoid false braking events." Tesla's Autopilot is way behind the technologies being developed by Waymo, Uber, etc. It's hardly even the same thing. Mandate on having same type of tires, same type of brake pads and same degree of wear-out for those would also make things work better. There is also a need to have same load in truck to make sure they accelerate and slow down at the same rate. No full or empty, every truck on the road has to be half-full, period. Those oversize or heavy trucks, underpowered vehicles - they have no right to drive on public road! Which is the exact reason I don't think they'll ever become commonplace. Governments won't want to give up the revenue that comes along with speeding tickets, and I think many people will want to go faster than those cars will allow, meaning they'll drive their own cars. And I hate slow left lane drivers as much as anyone. It's a pattern with them: they camp out in the left lane, blocking traffic. Because of that, passing traffic is trying to get around them now, too. the passers get impatient, so they end up cutting off the left lane car. Then that lefty feels unsafe and starts going even slower, getting cut off by even more people. Never do they realize that the problem it that they're in the left lane. Never. ...I don't think [self driving cars will] ever become commonplace. Governments won't want to give up the revenue that comes along with speeding tickets, and I think many people will want to go faster than those cars will allow, meaning they'll drive their own cars. Eventually, people won't be allowed to drive anymore, at least not on public streets. Tens of thousands are people are killed on the roads every year, but we turn a blind eye because we're used to it. The second the government figures out a way to prevent most of those fatalities from occurring, the "old way" will quickly become obselete or illegal. Humans just don't have a good history when it comes to operating large vehicles. As for speeding revenue, while that could be true, there's no way that could ever be a reason. I can imagine it now, "yeah, uhhh, those self driving things are uhh, too good. yeah, we aren't making uhh any money anymore, so yeah they gotta go mkay". So far, approach to vehicle certification seem to be "legal to sale on manufacturing date - legal to drive forever". I've met several Ford-T on the parking lot the other day... With license plates making them legal for the road. No seatbelts, though. So I don't see manual driving becoming illegal effective 1/1/20XX, because that will outlaw those Ford-Ts.. ANd there is no way to make them self0driving, apparently. Banning manual-drive vehicles certainly seems far-out, considering how ingrained they are in our culture. And I'm certainly not looking forward to the day that they do get banned (and its hard to say if it will be a specific day or a gradual process). I'm just not sure how else we're going to reach that "vision zero" target (even if it takes way longer than that 2030s goal). Like I said above, humans just aren't trustworthy. My guess is that we'll build roads that don't allow self-driving, and after a while, merge everything. I saw many cars with Ohio tags "Nestoring" on the WV Turnpike on my recent vacation to Va. Beach. I sometimes wonder if the Ohio Turnpike needed the third lane for such long stretches if folks used proper lane discipline. Three-laning was necessary due to the amount of traffic using the pike between Youngstown and Toledo. When they rehabbed/paved the Turnpike in the 2 lane-days, one direction. Would cross over and there would be 1-lane traffic in both directions. During those times, there were weekends and holidays where you would regularly have miles-long backups and delays approaching these zones. Multiply that times 3 or 4 zones between those two cities and you can see that adding a lane was sorely needed. Now there is almost always at least 2 lanes in each direction in work zones and no cross-overs. In addition, if I miscalculated the need for passing or the car I was planning to pass has sped up or left the road, I will let whoever will be passing me on the right to complete said action before returning to the right lane. Looks like I-64 westbound in Norfolk, Virginia approaching the Hampton Roads Bridge Tunnel (HRBT), a place notorious for queues like this. Do you like it? Hate it? Do it yourself? What are your thoughts on making and enforcing a law "keep right except to pass"? In countries such as Sweden, such a law already exists in the form of "no passing on the right". If you want to pass someone who is in the left lane, you flash them and wait until they get over. Swedish drivers do something else that I like (on Super-2 highways and on 2-lane undivided rural arterials - they will move onto the shoulder (when available, and it is not always there) to let faster traffic by. This is not just on long uphills either. These are all reasons why our roads are more jammed than needed. If there's someone (or multiple) people behind you in the left lane, and you're staying in the left lane for any of the above reasons, you're the one causing the problem. I will modify my behavior when there are vehicles behind me trying to go faster, and no free lane to the left of me. If I can safely get into the right lane in such a situation without considerably dropping my speed, I do. If I can't, I speed up to whatever speed I feel safe going on that road (or to match their speed, whichever is lower) until I can get out of the way. I see this from time to time in the US. But usually only when the shoulder becomes a dedicated lay-by/pull-off. So I guess it doesn't count. In South Africa, I see cars pass directly on the center line, while traffic from either direction drifts into the shoulder as to accommodate. I don't think I've seen that maneuver in the US before. The only place I've actually seen it is in Washington - on SR 112 there is a signed opportunity to use the shoulder for passing, and a sign posted to that effect ("driving on shoulder permitted" or something to that effect). I feel like there's one or two other places on the Olympic Peninsula where that is the case too but can't remember off the top of my head. Center line passing is pretty common in Mexico - and in Bulgaria (as far as other countries I've driven in). I like driving where people do that - traffic flows really smoothly, and it doesn't seem particularly dangerous if everybody is paying attention. I drive Hwy 410 between Yakima and Bonney Lake every summer, and there are several areas along the route where signs point to the shoulder with "SLOW VEHICLE PULLOUT" written on them, indicating to slow drivers to use the shoulder to allow faster vehicles by. This low-res Street View link was the first example I could find, but there are more. I think there's even one example where the shoulder line becomes dotted, but I can't quite remember where. Yeah, I quite like it! I seem to recall having read somewhere that "improper passing" was the third most common cause of road deaths in South Africa, so I approach the idea cautiously. But lack of driver education/training makes the maneuver more dangerous than it needs to be. Yeah regular slow vehicle turnouts are pretty common in the west - very common in Idaho especially (and strictly enforced!). Wow, I've never seen something like that. Which makes sense, because I've never been out that way. But WSDOT has been open to shoulder driving for a while now. Started with the "WB" Hwy 16 off-ramp towards Purdy. Now, the 405 has shoulder driving NW of Bothell. I'm not sure when this particular stretch of shoulder driving was put in, but I'd love to see more of them.